Te Whiringa o Manoko (The interweaving of the cultures of Kerikeri) 1978 – 2009, Kerikeri, NZ. 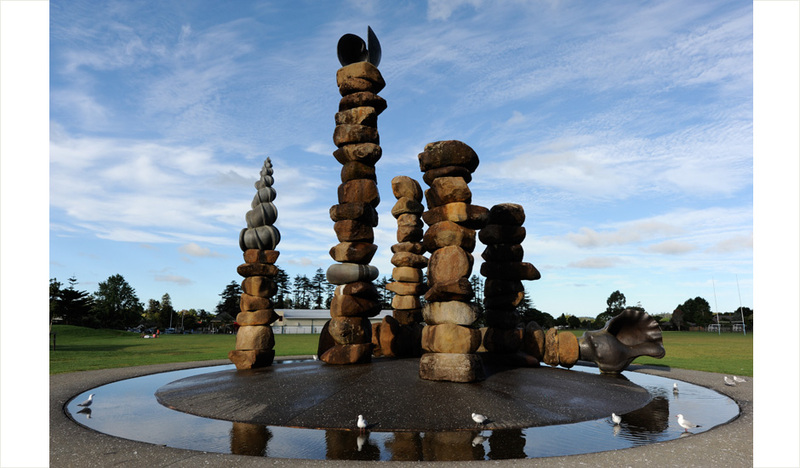 The sculpture was named by the kaumatua of Ngati Rehia and the karakia (prayer/blessing) was carried out by Hirini Kingi. The design was originally conceived in 1978 and then short listed for the Auckland Aotea Square Water Sculpture competition in 1979. It has ever since been promoted to be sited in a public place in Kerikeri. From the early seventies I developed boulder column concepts in Kerikeri. But it was not until 1986 that any were realised to full scale (Entranceway, Paihia; Gateway, Auckland; Rainbow Warrior Memorial, Matauri Bay). Since then they have been created in many countries worldwide. Therefore this water sculpture design precedes all other realised designs. The columns were inspired by having been raised in Kerikeri, playing in the Kerikeri boulder strewn river and amongst the very tall columnar like gum trees, plus the giant Kauri trees of Puketi Forest. The volcanic boulders excavated from the very ground of Kerikeri symbolise the excellent draining volcanic soil used by horticulturists for at least 800 years. The shell forms derive from shells found in the forest (pupurangi – kauri snail) and shells found in the bay. Settlers, both Māori and Pakeha in Kerikeri, traditionally used the waterways for communication. Kororipo (the Stone Store Basin) was the door to communicate with nearby or distant destinations. For residents today who grew up here, Kororipo (the Stone Store Basin) still means the same. Therefore there is a tie with the forest to the sea. The earliest settled interweaving of Māori and Pakeha cultures in New Zealand began here in Kerikeri, right where I was brought up and still live.